Home > Storage > HP Storage > Storage Area Network Arrays > iSCSI/FC Combo SAN Arrays > HP MSA 2040 SAN > HP MSA 2040 SAN 2.5"
Wondering if the HP StorageWorks MSA 2040 2.5” Bay (Storage Area Network) iSCSI Fibre Channel Combo array is right for your business continuity and budget? Check out our Survival Guide: Avoiding A Data Apocalypse today! 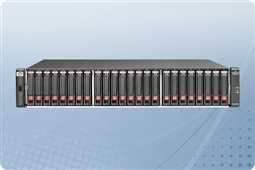 Are you looking for the same balance of flexible network performance and high availability in a 12-bay 3.5" chassis? Please check out our LFF MSA 2040 SAN models! Are you looking for the same system with 12Gb SAS connectivity? Please browse our MSA 2040 SAS storage systems!